Outside of Italy, January 6th is held to be one of the most depressing days of the year, back to work with no official respite for grown-ups until Easter, if only we all adopted Italy’s most famous witch La Befana and her sprinkle of magic. This feisty old witch beat Italian Catholicism into accepting her pagan broomstick ride over the country to drop off sweeties to good children after she procrastinated on her invite from 3 Wise Men to help them find Bethlehem and a new king. ItalyHeritage has the comprehensive summary of the history of Italy’s most generous witch, but it’s worth dipping into Shakespeare and his Twelfth Night for another insight into how magical the night preceding Epiphany previously was for families long ago as they looked into their log fires to seek out omens for their crops in the coming year. Punishment, expectations and rewards were moulded into mythological and then Christian figures that softened the worries of famine. La Befana brought rewards to both the good and bad, the benevolent coal or onion she left for naughty children meant a warm fire for them to sit beside or a health boosting dinner ingredient. 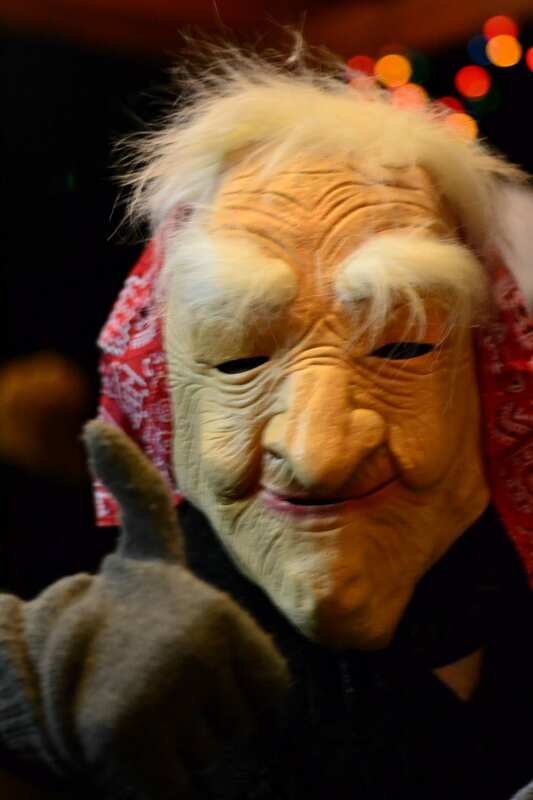 In our small village in northern Abruzzo, La Befana is a time of fun, the village joins together, scrabbling about for sweets that are thrown by 3 masked and silent interpretations of Le Befana start the celebrations. The children of the village are gifted stockings, brimming full of gelatine sucky sweeties handed out from an enormous hessian sack by the 3 witches. All the villagers march around our hamlet behind a big bass drum and solo accordion player down to the village bocce/social club where everyone can gobble down the very best home-made sausage pizza and of course pizza with French fries for the kids – (whoever said that Italians were snobby about pizza toppings hasn’t yet experienced their own version of this wicked favourite). Parents and grandparents get to drink the very best soft honey & fruity home-made wines from grandfathers’ cantine, and dance polka and other folk tunes played by 3 accordion players and an acoustic guitar. As a woman in an overly image and age conscious world, I love that La Befana remains untouched, simply an ugly wrinkled old lady who wear rags and patched clothes. Her celebration in our village makes the usual routine of taking down of a Christmas tree and lights to close Christmas seem so glum, lonesome and finite instead of what it could be a continued celebration of children warming food and dance. There are 2 ends to Christmas and there are ways to make it end on a high! But also the snow !! Christmas just starts tonight! For Orthodox Christians. So Merry Christmas! Merry Christmas Mikhail, are you going to be celebrating in Italy or are you back home in Russia? We are celebrating in Loreto Aprutino but it looks like in Russia with so much snow. Great idea, wish l could join in the party!